Pen and wash in sepia inks, in mount as required. 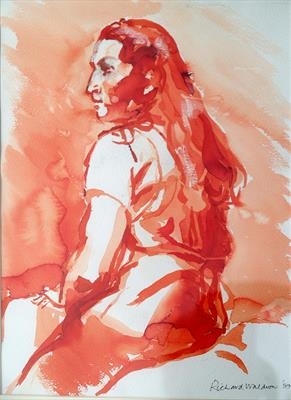 A young woman seated and thoughtful. The style is realistic but free. Available as open edition Giclée print for £150 with certificate of authentication. Drawn in a life class with the excellent teacher and mentor Keith Hutchinson, a good friend in East Sheen. Also available as limited edition Giclée on canvas print with authentification for £150.